Disciplined Systematic Global Macro Views: Private equity - The big overweight for high performing investors, but will it last? Private equity - The big overweight for high performing investors, but will it last? The last twenty years have been golden period for private equity investors. Those who held a high overweight to this sector shot to the top of the rankings as shown in a report by Cambridge Associates, "Private Investing for Private Investors - Life can be better after 40%" last month. There is no disputing that private equity has had a great run of performance and has outpaced public investments. Nevertheless, there have been concerns voiced abut this performance after risk, leverage, and liquidity as been appropriately measured. 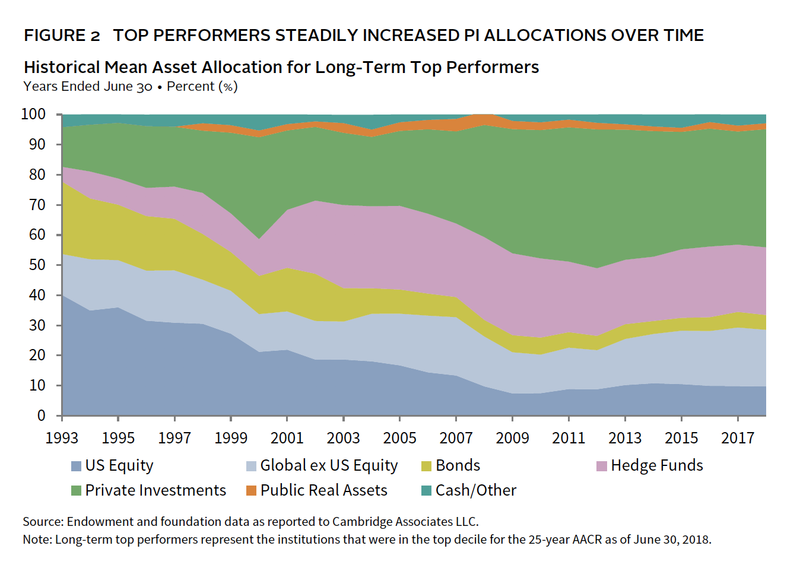 What is astounding is the high allocation that top endowments and foundations have given private equity investments. 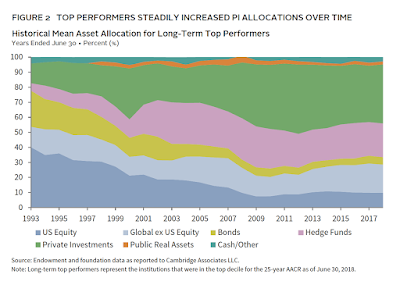 Forget about asset class diversification, the long-term top performers have all in big for this asset allocation. These investors may have lower liquidity needs than pensions, but this is a surprisingly high number. There is diversification within private equity across regions, industries, and classes but there is commonality with small cap risks, leverage, and limited liquidity. Private equity investments do not allow investors to easily trade out of your mistakes. There is risk with trying to replicate the performance of the past through strong over-weights in the future. 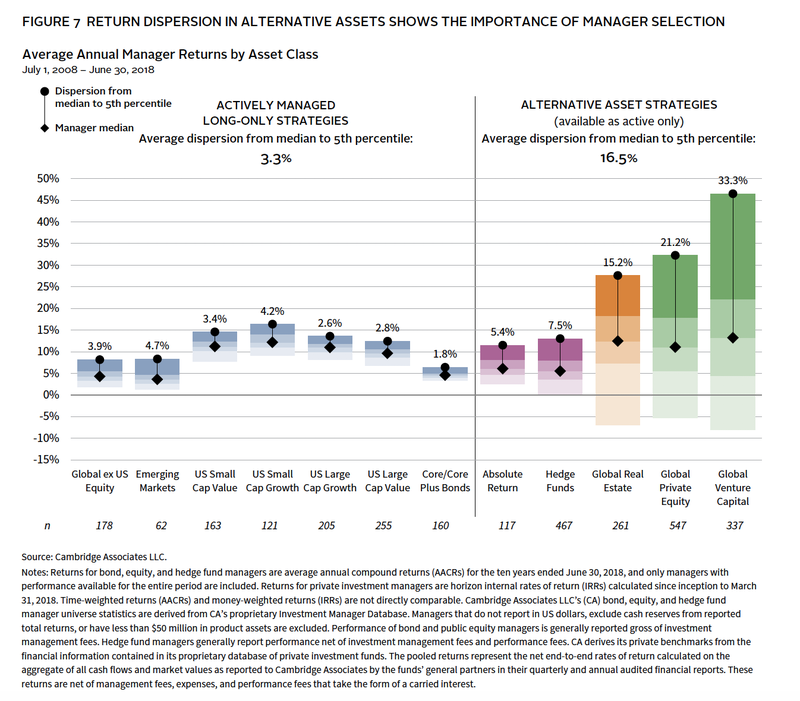 As shown with the dispersion of returns by asset class, there is significant risk with the private equity manager you pick. 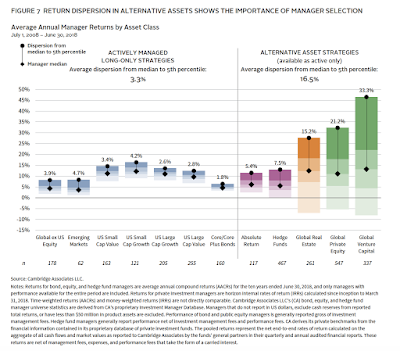 Based on the median returns, there is some gain versus risky small cap and small cap growth, but the threat of being wrong with your manager selection is large. More important, topping up your private equity exposure or holding a 40% allocation is dangerous if you believe we are late in the business cycle. All private equity is not the same, but any downturn will negatively impact these underlying investments. 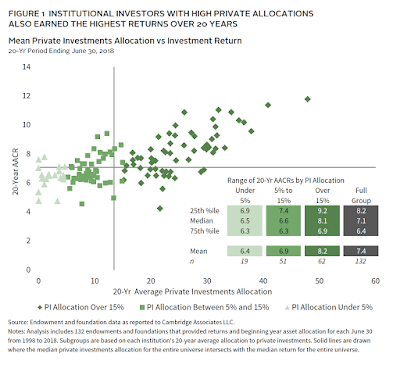 Of course, private equity is not marked to market on a regular basis so investors do not have to face the higher volatility of public investments. Nevertheless, smooth returns on an accounting valuation are not the same as smooth returns on an economic basis. Infrequent marks will create the allusion of diversification that does not exist. This may not be the time to follow the past market leaders.